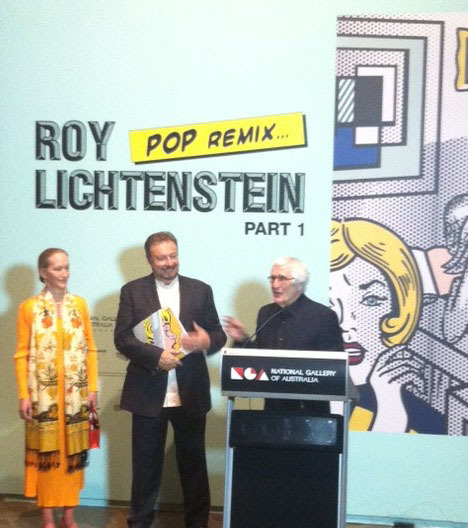 Media and staff gathered last Friday at the National Gallery of Australia for the media preview of ‘Roy Lichtenstein: Pop remix’, which opened to the public on Saturday 20 July. 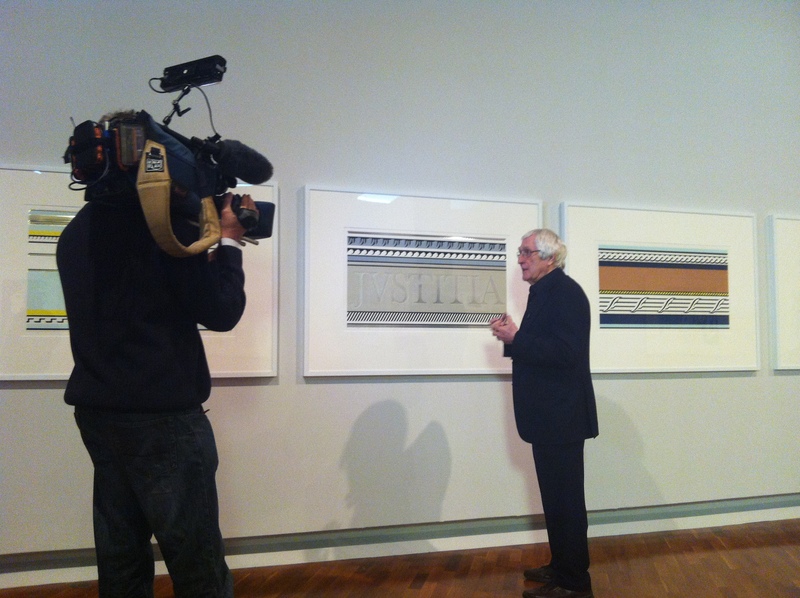 The excitement was palpable as Ken Tyler– who travelled to Canberra specially to open the show–recounted some of his unique experiences of working with Roy Lichtenstein. Thank you to both Ken and Marabeth Tyler for making the long trip from the U.S. to be here. Ken Tyler discusses a series close to his heart: the Entablatures of 1976. 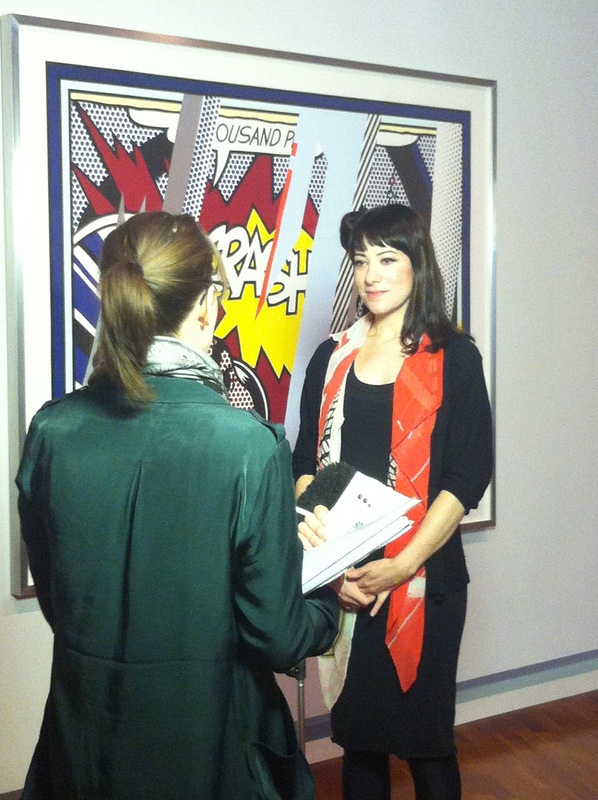 Curator Jaklyn Babington spent over 12 months selecting the works that would form the Lichtenstein exhibition; considerations included the period of the artist’s career to be covered, followed by an in-depth analysis of each work and series. The first room of the exhibition features a group of rare 1950s woodcut prints by Lichtenstein, displaying his transition from an expressionistic style into Pop Art. Originally forming part of the artist’s personal collection, these works have never before been displayed in Australia. The works in the exhibition make reference to and remix no less than nine different art movements or styles: Impressionism, Pointillism, Surrealism, Abstract Expressionism, Op Art, Cubism, Art Deco, Classicism and Constructivism. Roy Lichtenstein: Pop remix returns to the National Gallery of Australia after touring for over 12 months and covering 8,800 kilometres across three states as part of the Gallery’s Travelling Exhibitions Program. A total of 21,084 people saw the exhibition at three venues: Mornington Peninsula Regional Gallery, Mornington (VIC), QUT Art Museum, Brisbane (QLD) and Araluen Arts Centre, Alice Springs (NT).